Treating yourself to a pedicure in a salon or spa is one of the most relaxing and luxurious beauty gifts you can give yourself, but more often than not, the experience is bad for your health and equally bad for the environment. Instead of shelling out loads of money to have someone soak your feet in potentially hazardous concoctions, slather your tootsies in chemical-laden lotions and paraffin waxes and paint your toenails with toxic polishes, try this all-natural, organic DIY pedicure instead. It’ll be a breath of fresh air for tired, sore tootsies in need of some guilt-free TLC, and it may even rival those organic pedicures offered at the world famous BLC SPA. Tell the family you're going on hiatus and then light some candles, put on some soothing music and give yourself a bit of a retreat for 20 minutes with a relaxing, softening footbath. Simply fill a footbath or basin with warm water, a tablespoon of organic almond or olive oil, and two organic lemons cut into a few slices. Soaking your feet in the mixture will soften, smooth and invigorate your tired limbs as well as start to loosen any existing shellac on your tootsies. As with any pedi, it’s important to polish your feet and get rid of calluses with either a pumice stone or an exfoliating foot scrub. You can homemake a refreshing peppermint foot scrub by mixing 1/2 cup of any organic salts (Epsom and sea salt are good choices) with 1 teaspoon of organic coconut oil and a couple of drops of pure peppermint essential oil. Use both the pumice stone and a foot scrub for extra exfoliation and callus removal. You may be able to skip this basic maintenance mani and pedi step, depending on the condition of your feet. If you’re currently wearing nail lacquer or shellac, use an organic nail polish remover such as Karma Organics’ lavender and soybean oil polish remover to gently remove it from each nail. Follow by carefully clipping your nails straight across and not in a curved shape, which could lead to ingrown toenails. It's recommended that you not cut your cuticles, because a sliced or cut cuticle can lead to infections. But you can use a bit of organic oil to gently massage into each cuticle if they're dry or uneven. One of the most beneficial steps of any manicure or pedicure is moisturizing your skin and nails. Choose an all-natural, organic cream or lotion to massage onto your feet, toes and each of your toenails. Allow yourself some time for the foot massage — this is your special retreat, after all! Most nail polishes contain numerous toxic chemicals, so if you plan to paint your toenails during a pedicure (or your fingernails during a manicure), be sure to choose a safe, organic nail polish. Companies like Organic Glam and Karma Organic offer polishes free of toxic toluene, formaldehyde and DBP. 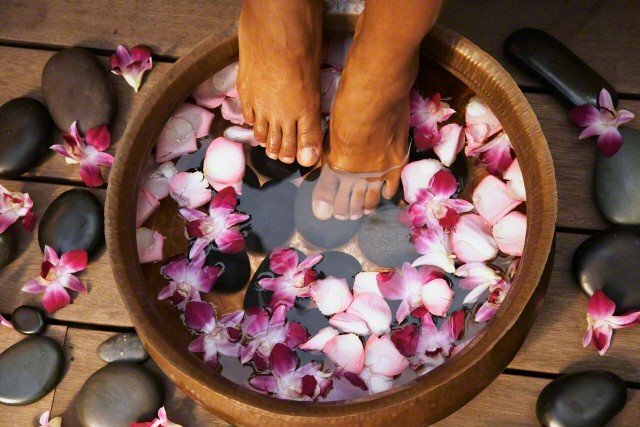 This easy, DIY organic pedicure will leave your feet feeling and looking soft, beautiful and as healthy as if you'd splurged on a BLC SPA pedicure. And the best part is that you can feel great about the choices you made during your self-imposed retreat — for both your tootsies and the environment.